Two years ago, we set out to increase our use of renewable energy to power the datacenters and operations that support our growing cloud. Our goal was to use 50 percent renewable energy by 2018, 60 percent by early 2020 and continue increasing from there. Today, we’re taking another step forward in this journey by signing the largest corporate solar agreement in the United States, a 315-megawatt (MW) solar project in Virginia – Microsoft’s largest purchase of renewable energy to date. Today’s announcement brings our directly purchased renewable energy total to 1.2 gigawatts – enough power to light up 100 million LED bulbs. Combined with the six agreements we’ve struck over the last two years, this deal puts us over our 50 percent target and moves us toward our 60 percent goal well ahead of schedule – even as we continue to grow. 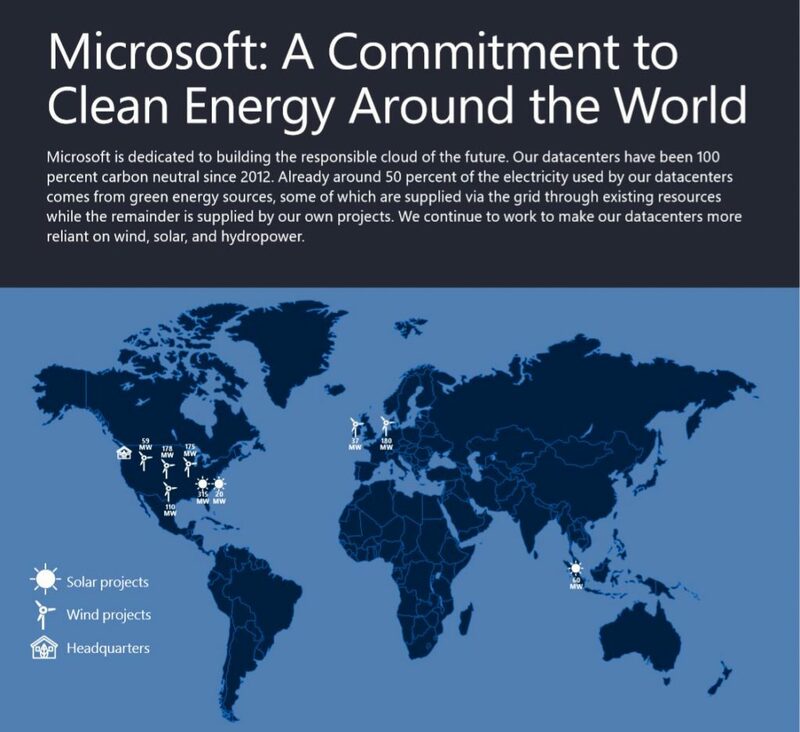 Microsoft’s commitment to procuring clean energy for our datacenters, while helping accelerate the transition to a greener grid, now totals 1.2 gigawatts—with nine direct wind and solar agreements across the United States, Ireland, The Netherlands and Singapore. Click the image to view the full infographic. This project is our second solar agreement in Virginia and allows our Virginia datacenters to be powered fully by solar energy. To give you a sense of scale, our project will utilize 750,000 solar panels spread across more than 2,000 acres. It is also part of a larger 500 MW project that will double the current solar capacity in the commonwealth – leading to more clean energy for our neighbors in the community. But this project means more than just gigawatts, because our commitment is broader than transforming our operations – it’s also about enabling others to benefit and participate from clean energy. Our corporate energy goal is part of a larger goal to green the grids around the world. To achieve that goal, we must find new ways to accelerate the transition to a low-carbon future. That’s why we have crafted our energy agreements in a way that offers our generators as backup generation to the grid in Wyoming, as well as piloted integrated energy storage batteries with GE in Ireland. Our newest deal in Virginia similarly uses a new approach. We took a majority stake in the project by taking 315 MWs of the total 500 MW project. As the project developer, sPower, notes in the release on today’s news, this enables them to offer more competitive rates to other buyers for smaller portions of energy, even in this kind of a megadeal. This kind of model could be used to allow buyers of any size or sophistication to participate in the clean energy economy, accelerating the pace of change and lowering carbon emissions all at once. While we’ve made a great deal of progress, we still have a long way to go. As we look toward 2020, we are exploring new models and methods for aggregation. We will continue to push the envelope on R&D, looking for new ways to improve our energy efficiency and enable our datacenters to benefit the grid. And we are more active than ever on the policy front, working in Washington, D.C., state capitals and internationally to help craft policies that enable everyone to have access to a fair, competitive market rate and improved access to clean energy.